This past Sunday, I ran the 29th Emerald Across The Bay up in San Francisco. The race was is 12K, point-to-point from Fort Baker, up to and across the Golden Gate Bridge, down around to Fort Point, and then on to the finish near the east side of Fort Mason. As it was for last week’s 408K in San Jose, the day was PERFECT for a run. The temp was fine for shorts and long sleeves; and the sky had just a few clouds blowing through. The tailwind was also a plus as all 2,179 of us crossed the bridge! I mean come on – with a sunrise and sky like those below, who wouldn’t want to run – especially across the Golden Gate! Anyway, The race was extremely organized and well run – from arrival, parking ($10 for 4 hours at Ghirardelli Square for racers! ), transportation to the start, sweats check, starting line control, on-course management and directions, etc. – EVERYTHING was on point and made the race enjoyable. Like the weather, my race day – on a personal level – was all I asked for. I left home early to avoid any traffic and parking rush and got to Aquatic Park at about 0615. I parked at Ghirardelli Square, located a clean, flushing toilet(! ), and took care of pre-race business. I headed to the bus pick-up zone and got my bearings – still with enough time to sit in Starbucks for a coffee. 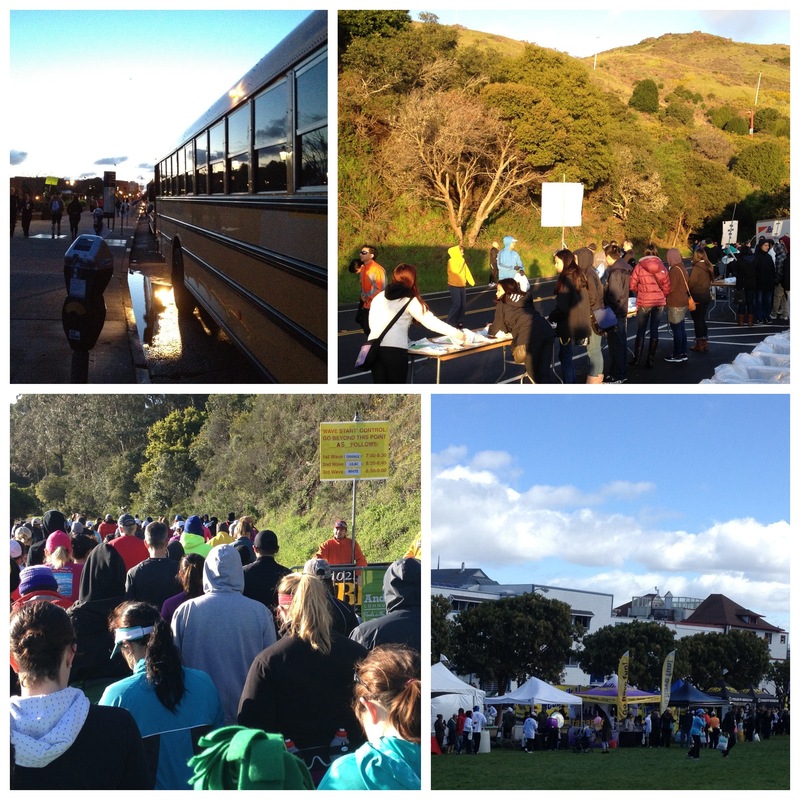 Just before 0700, I boarded the shuttle bus to Fort Baker with the growing mass of people. It was a nice ride and offered some good views of the bay and Bridge. The bus dropped people off and the groups walked to the start queue area for pre-race sweats check, potty breaks, warm-ups, etc. It was great to see the wide variety of people running…and standing in the sun to keep warm. I was part of the third wave start – which I signed up for back in November 2011. Given my current training level, I probably should have opted for the first or second wave, but at the time all this was an unknown. My goal time for the race was 68 to 69 minutes, based on a conservative, negative split pace plan ranging from 9:30 to 8:30 – not knowing how I’d do on the climb to the bridge deck or the final climb at Fort Mason. With a GOOD tailwind, locating and pacing some good, fellow runners, and, quite honestly, and my training (including my tempo and hill repeat sessions), I blew the 68 minute goal out of the water by five minutes with better-than-planned pacing (see below.) I ran all the hills (two: up [8.4 and 8.7% grade*] and down [5.1 and 7.8% grade*]), with a climb-to-the-deck pace of 9:20 and a climb in Fort Mason pace of 8:13. This being my ninth organized race since starting to run last September: ME HAPPY! Garmin time: 1:03:15 at an 8:24/mile pace. Official time: 1:03:17 at an 8:32/mile pace. As I wrote above – it was a great day. I hung around at the expo for a bit, watched the top finisher awards presentation, grabbed another Starbucks, and headed home. My post-race meal was a great one at El Burro, where I gorged on CHIPS…chased with a couple of tacos and a little bit of beans & rice. I can really see and connect the benefits of training – especially with this race since it incorporated hills (up & down), wind, some trail, a lot of pavement, and other factors. I can’t imagine doing without the structure of a training plan.